The most common type of Raster graphic is a photograph or an image created using Adobe Photoshop. Popular Raster file formats include: JPG/JPEG, PSD, PNG, TIFF, BMP, GIF etc. 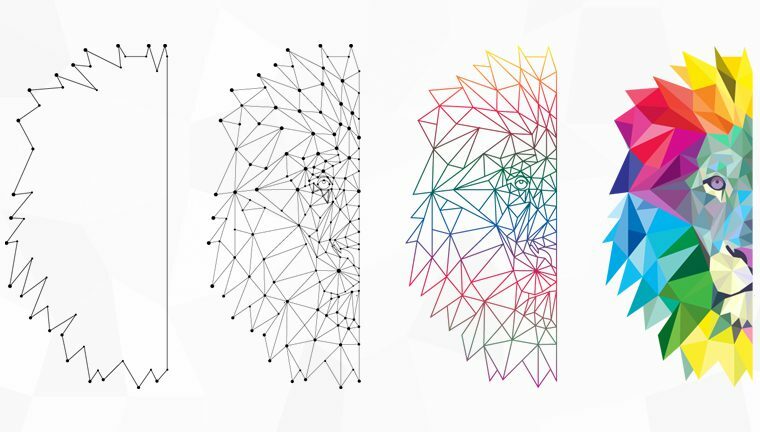 A Vector image uses math to draw shapes using lines and curves. So a Raster image of a 1” x 1” square at 300 dpi will have 300 individuals’ pieces of information. A Vector image will only contain four points, one for each corner; the computer will “connect the dots” and fill in the missing information. The most common types of Vector graphics are Fonts and Logos. The designer’s go to program for creating and editing Vector files is Adobe Illustrator and Corel Draw. Most common Vector file format extensions include: EPS, AI, PDF & CDR. 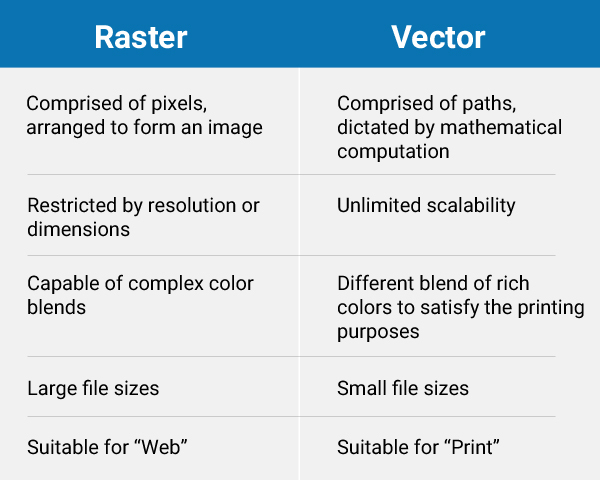 When should you use Raster or Vector? Raster format is best for Photographs while Vector format is best for just about everything else, print ready Logos, Illustrations, Engravings, Etchings, and Signage. Many in the industry consider Raster images to paintings and Vectors to drawing; if your order requires a complex blends of colors like in paintings, Raster is the chosen format; however if your order requires scalable or large shapes in solid colors or with shading like in drawings, Vector is the best choice. Many of your orders will combine both Raster and Vector files together, for e.g. a brochure or a postcards, it include a corporate logo (Vector), illustrated background (Vector) with a photo of happy customers (Raster) or a foreground photo (Raster). Ultimately, it comes down to what you’re creating and its intended use. If you need a logo that will be used time and again in multiple media – print, digital, television, product etching, signage, etc. – you should request a Vector art image that can be enlarged or shrunken as-needed without any affect to its clarity and quality. If you want to edit a photo or make a digital painting, you will likely want to create a Raster image which is capable of rendering color blends and mimicking the natural qualities of light. Whether your order calls for Raster images or Vector graphics – or both – be sure your final piece looks as amazing in print as it does on your computer screen. We’ll be here always to ensure you get exactly what you need to impress your clients and continue to grow your business.